The Miller Physical Education Building is the newest building on Kellogg Community College’s (KCC) main campus, replacing the former Miller Memorial Gymnasium, constructed in 1966, in approximately the same footprint as the original building. 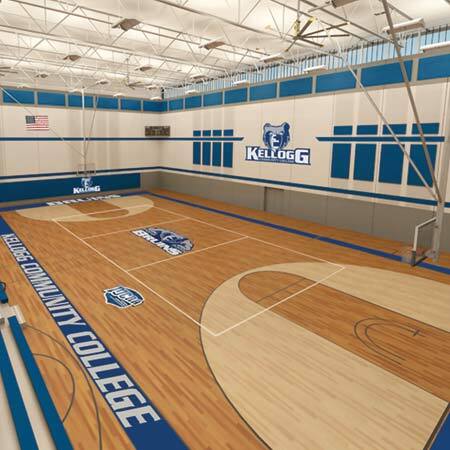 It is designed as the home of KCC’s acclaimed competition athletic teams, KCC physical education classes, student and staff recreation facilities, academic classrooms and training spaces for multiple KCC programs, staff offices, community education spaces, and support area. The building is organized by function and space volume, with the largest volume being the primary multipurpose gymnasium space, which anchors the building and makes a strong presence along North Avenue. The lower roof areas are organized to screen the rooftop mechanical equipment from the main entrance and North Avenue. The custom configuration of the metal panel exterior provides an economical solution that is also interesting, attractive, and durable. 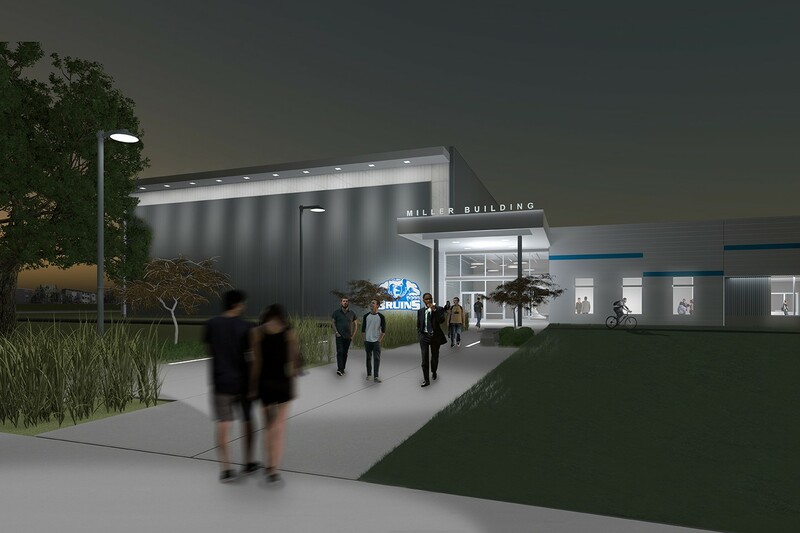 The new public entrance proudly announces the building with a broad pedestrian concourse that also intersects the Battle Creek Linear Park that passes in front of the building across the KCC campus. Natural light flows throughout the building, offering excellent views, orientation to the site, and openness at large spaces. In selected spaces, such as the main gym and exercise spaces, natural light is filtered to prevent glare and to provide privacy. The largest single space is the NCAA regulation size competition gymnasium for basketball and volleyball, designed for single competitions and tournament play, as well as multiple simultaneous competitions and practices by means of a large dividing curtain.